Writing an article about OptimizeMyAirbnb.com? We thought we'd give you some key business facts and background to help you get started. OptimizeMyAirbnb.com started as "Belo: Airbnb Property Management". Since starting, the Belo business has now developed into "Optimize My Airbnb" services and the "Optimize Your Airbnb" books and resources. Starting as a locally operated, Airbnb property management company, Optimize My Airbnb is now operating in the international marketplace. Danny's current client portfolio includes customers from all 5 continenets and over 20 countries worldwide. A former Airbnb employee, an experienced Airbnb Superhost, promoting properties for himself and clients for five years. Formerly an accountant, before becoming an entrepreneur, Danny is experienced in administrating profitable businesses, and has gained vast marketing experience. Having gained fantatsic traction in the online optimization market, Danny Rusteen is now also producing resources and books for purchase by the general public. OptimizeMyAirbnb.com and other projects that are related to brand have featured in the press and digital media. In this episode I talk to Danny Rusteen of Optimise My Airbnb. A CPA and former employee of the company, author, property manager and Super Host, and self-professed Super Guest, Danny is a digital nomad, travelling the world while he supports hosts with services to help them achieve greater success. We were fortunate to have Danny Rusteen of OptimizeMyAirbnb.com join us to talk about how to rank higher for Airbnb SEO and book more guests. Danny is a former employee at Airbnb and now through his business helps hosts rank higher on Airbnb thus booking more guests. Is your Airbnb listing as good as it could be? Even if you are a Superhost, chances are there are at least a few changes you could make to your listing to get more bookings. On this episode, Jasper talks with Daniel Rusteen, an Ex-Airbnb Employee and the man behind optimizemybnb.com. Download our Airbnb Hosting Tips and Tricks Guide (FREE): http://sidehustlelife.co/airbnb-guide Other videos in this series: * PART 2: https://youtu.be/VI7OYlgbNY4 (AirBnB Hosting Pros and Cons - Being An AirBnB Host in 2018) In this video, we have Daniel Rusteen - former Airbnb finance and local operations employee, a Superhost, a super guest (250+ days in an Airbnb), and the owner of a remote full-service Airbnb property management company. Newest book on how to run an Airbnb and for the advanced host out there wanting to optimize how they turn their side hustle into a cash flow dream this book is for you! We did a book review and are giving you a sneak peek at one of the chapters. We were fortunate to have Danny Rusteen of https://optimizeyourairbnb.com/ join us to talk about how to rank higher for Airbnb SEO and book more guests. Danny is a former employee at Airbnb and now through his business helps hosts rank higher on Airbnb thus booking more guests. Danny from OptimizeMyAirbnb.com was kind enough to help me re-write my listing description live in front of the STRU community of over 7,000 Airbnb hosts. He has a ton of knowledge on what it takes to make a great online listing and he shares a bunch of it in this hands on listing re-writing collaboration we did. 45s explainer video for my book of strategies for the intermediate and advanced Airbnb host: Optimize YOUR Airbnb: The Definitive Guide to Ranking #1 on Airbnb Search is available now on all major retailer websites in paperback, digital, and audio. Find out more at https://www.OptimizeYOURairbnb.com "Daniel Rusteen's authoritative book is as comprehensive as it is enjoyable to read. Download a preview of one of the top chapters in the newest book that all Airbnb hosts need - Optimize YOUR Airbnb: The Definitive Guide to Ranking #1 in Airbnb Search. There are few times in your life when a first conversation just stays with you. 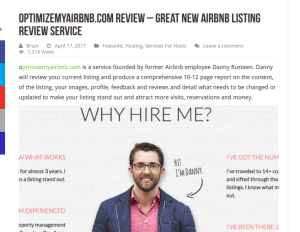 My first conversation with Daniel Rusteen, author of the newly released "Optimize Your Airbnb: The Definitive Guide to Ranking #1 in Airbnb Search," was one of those. San Francisco, CA About Blog Airbnb Citizen is a place to share stories of our hosts and their communities, and together find solutions that allow home sharing to thrive responsibly and fairly. Frequency about 6 posts per week. Since Dec 2012 Website airbnbcitizen.com Facebook fans 184,174. Twitter followers 25,146. Company Spotlight: OptimizeMyAirbnb.com, 'Supercharge Your Listing' Airbnb is like any application-with each iteration, developers add new bells and whistles, and it's your responsibility to keep up or risk falling behind your competition. That said, Airbnb often releases product updates randomly and to only certain hosts (e.g. Optimize YOUR Airbnb is a book of intermediate and advanced strategies for the Airbnb host wanting to take their income, guest experience, and hospitality to the next level. This information comes from years of reading, thinking, implementing, and testing strategies on the Airbnb platform. Optimize YOUR Airbnb is a book of strategies for the intermediate and advanced Airbnb host by Daniel V. Rusteen. Chip Conley: "Daniel Rusteen's authoritative book is as comprehensive as it is enjoyable to read. I have never seen so much valuable, actionable advice in one place for an Airbnb host. Belo: Airbnb Property Management was created to serve hosts with a desire to share their space with travelers from around the world, but without the resources (namely, time) to deliver a refined experience to those travelers. Think of Belo: Airbnb Property Management as the ‘places’ part of the image on this page. We strive to provide a clean and unique space for travelers where they can feel at home the moment they step in the door. Need some brand assets and media files to help you with your coverage? Download them here. 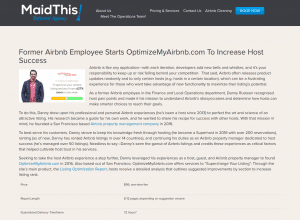 Media Pack: "Optimize My Airbnb"
Want more information about OptimizeMyAirbnb & Danny Rusteen? Send Danny a message to start your collaboration.